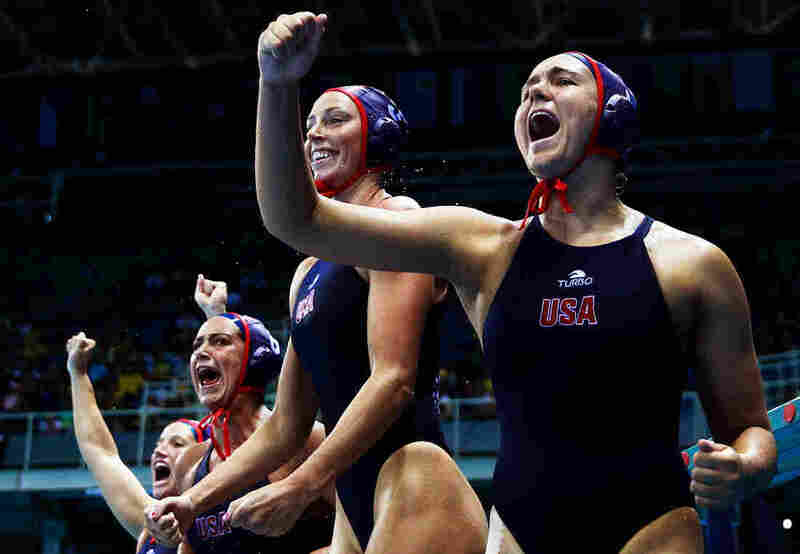 U.S. Women Look To Defend Gold In Water Polo On Friday : The Torch The Olympics can be rough on parents who are watching their kids compete. 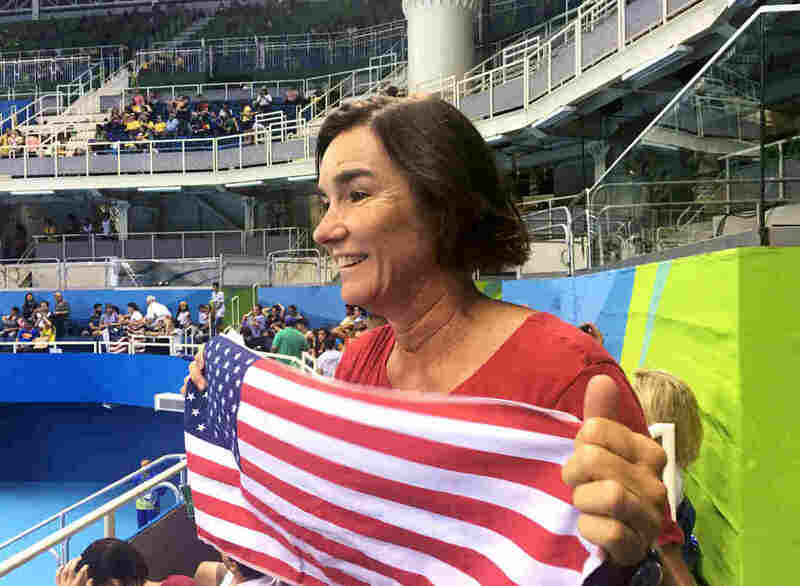 Like the Fischers, whose daughters, 19 and 17, are part of the women's water polo team that's one game away from gold. 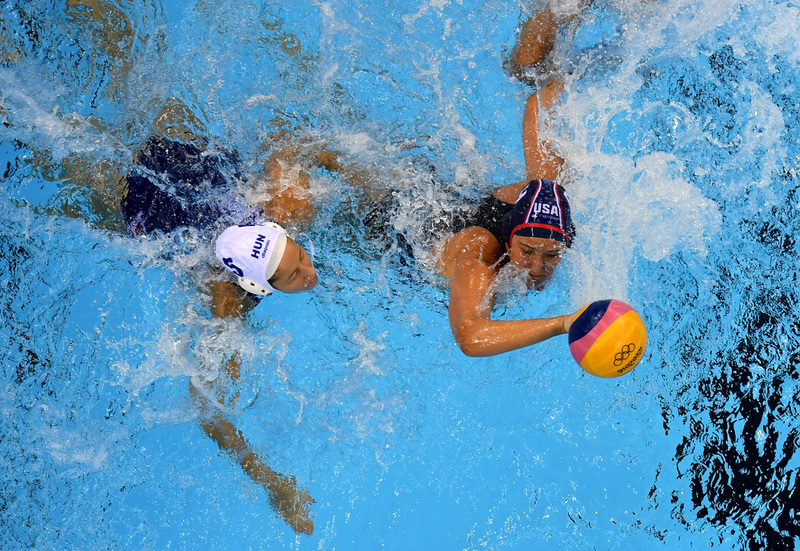 Gabriella Szucs of Hungary battles with Courtney Mathewson of the U.S. during the women's water polo semifinal match on Wednesday. The U.S. won, 14-10, to advance to the gold medal game against Italy on Friday. Leslie was wearing an American flag towel around her neck. She had a big U.S. flag to wave, and a very well-worn flag scarf tied around her handbag. She has brought it to every tournament since the girls were kids. "A lot of us have some sort of little something, especially the moms, that (we) bring as good luck," she said. Fischer greeted each U.S. goal with a joyous whoop, and each Hungarian goal with a groan. "Go, go, go, go, go!" she shouted, egging the players on. "Nice, nice, nice, let's goooo!" At one point, she rose out of her seat as she saw a Hungarian player flip her daughter Makenzie over on her back. "Heyyyyyy!" she shouted toward the referees, but no foul was called. "The Hungarians are gonna fight till the bitter end, as they should," Fischer said. "So, yeah, I'm just always nervous. Always. It's just, I think, the role of a parent!" Makenzie (team nickname: "Fish") plays defense. Aria is a center, on offense. They were born into a water polo family. Leslie played at Stanford, where she met her husband, Erich. He played on the U.S. men's water polo team in the Barcelona Olympics in 1992, where the squad finished fourth. So the Fischer parents are watching their young daughters surpass their own dreams. The U.S. women, ranked No. 1 in the world, dominated throughout the physical match with Hungary. They trailed by one goal for a total of 44 seconds. In fact, that's the only time the U.S. women's team has trailed an opponent in the Rio Games. As the clock ticked down to zero, Leslie Fischer cheered lustily: "Whooo! Way to go USA!" Final score: U.S. 14, Hungary 10. "It's always nice to win, but that's a really nice win," Fischer said. After the game, a big contingent of U.S. family and friends gathered in a hallway, waiting for the team to come out after showers and random drug testing. As she waited, Leslie Fischer said Makenzie and Aria played a little bit of everything growing up: basketball, soccer, volleyball, tennis and more. "Both of them really wanted to do gymnastics and we let them do it for a little bit, but told them probably that was not going to be the sport for them, since they're so tall!" Makenzie is 6-foot-1 and Aria is 6-foot even. One by one, the U.S. women emerged, some with bags of ice taped around their aching shoulders. In water polo, you take a real pounding, which, as a former player, Leslie knows all too well. "It can be very hard watching your daughters getting beaten up," she said. "But my girls don't shy away from it. That's part of what they like. So knowing that they like that aspect of the game, you kind of have to just sit there sometimes and bite your tongue and hope they don't get injured." Finally, after a long wait, older daughter Makenzie appeared. "So proud of you," her mom murmured as she folded her into an embrace. Dad Erich beamed. "You're goin' to the gold medal match! Whooo!!!" Finally Aria came out, wide-eyed and grinning. "My thoughts are all jumbled right now," she said. "I'm just really trying to take energy from this win. It hasn't really hit me yet. I don't know, I'm just a 17-year-old, so this is pretty cool!" Soon, the daughters said goodbye to their parents, and went off to rest and regroup for Friday's gold medal match with Italy.